It's November of 2020, and the world is freezing over. Grieving and ready to build life anew, Dylan heads north to bury his mother's and grandmother's ashes on the Scottish islands where they once lived. Hundreds of miles away, twelve-year-old Estella and her survivalist mother, Constance, scrape by in the snowy, mountainous Highlands, preparing for a record-breaking winter. [Fagan] is disarmingly subtle. Rather than turning the book into some survivalist potboiler, she renders this new Ice Age in snatches of distant newscasts and school closures, an intimate, at times mundane view of the apocalypse that captures what so much apocalyptic literature loses: the way humans can become mute, withdrawn, and even darkly humorous in the face of doom, rather than running around in panic. Fagan’s novel balances the oncoming climate disaster with the human-scale stories of these characters, focusing especially on Stella, whose feelings about her sexual identity are refreshingly resolute...Stella’s intrepid and sometimes dangerous attempts at self-care, and her ­coming-of-age under the pressure of ­societal disapproval and global threat, are the emotional anchors of the narrative. The interior lives of the adults in the novel are not quite as precisely drawn. There is a good reason why apocalyptic novels often feature young protagonists: growing up does feel like the end of the world. For transgender Stella, this feeling is even more pronounced. She is becoming a teenager, and is horrified at the thought of her male puberty. We see her conflicts with her GP to get hormone blockers, and with her schoolmates to gain acceptance. Fagan contrasts the beginnings of Stella’s puberty beautifully with the unstoppable approach of a huge iceberg set to crush Scotland. The plot does drag a little in the second part of the book. Fagan also has a tendency to repeat strong and unusual images (the three suns, Constance as the woman polishing the moon) until they have lost their power. But these are small quibbles with what is otherwise an immersive and accomplished novel. 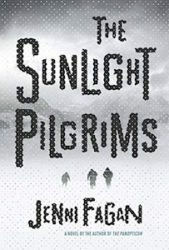 What did you think of The Sunlight Pilgrims?